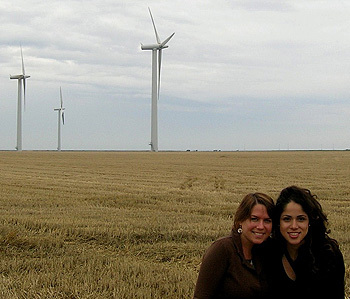 Undergraduates Lara Hale (left) and Mona Hammoudeh (right) were among the UCSC students who visited wind farms and other renewable energy facilities in Denmark last summer. Photo courtesy of Lara Hale. Last summer, U.S. and Danish students learned firsthand about renewable energy technologies being implemented in Denmark through a program organized by faculty at the University of California, Santa Cruz. Next year, UCSC will host the four-week summer program, along with NASA Ames Research Center in Silicon Valley. The Lolland California Renewable Energies (LoCal-RE) program is an international collaboration between three UC campuses--Santa Cruz, Davis, and Merced--and Denmark's Roskilde University and Technical University of Denmark. According to program organizer Ali Shakouri, a professor of electrical engineering at UCSC's Baskin School of Engineering, the focus is on the real-world challenges of implementing renewable energy technologies. Last summer, UC students joined Danish students in Lolland, Denmark, to study renewable energy resources such as wind, biogas, and hydrogen. They reviewed "big picture" questions about energy availability and the technologies currently used to harvest renewable energies. But the main focus was on the policies that govern the resources and the problems encountered in implementing renewable energy technologies. For example, wind farm crews told students about problems caused by lightning strikes and the need to change the oil in all the wind turbines every five years. They also described how they dealt with those challenges. "These are the kinds of things that give us perspective on how difficult it is to implement some of the ideas that on paper seem quite easy," said Shakouri. Learning from experts in the field was one of the greatest successes of the program, Shakouri said. Instead of just listening to lectures, students observed firsthand the challenges encountered and solutions implemented in real situations. The group spent two weeks of the month-long trip on excursions to large- and small-scale energy projects, including Lolland's Nysted Offshore Wind Farm, which is one of the largest in the world, and the Lolland Community Testing Facilities, an international testing and demonstration platform for renewable energy technologies. The students collaborated in small groups to write final reports on a real project. "We realized students do much better when they do something in a social context," Shakouri said. "Because the projects were about local problems in California and in Denmark, students were much more interested." Diverse student backgrounds, from environmental studies to electrical engineering to economics, allowed the groups to examine all angles of a particular energy problem. "It was a great learning experience," said Shakouri. Next summer at UCSC, Shakouri hopes to increase the number of students to 40, with 20 from the U.S. and 20 from Denmark. Students will visit several renewable energy sites in California, including solar farms, wind farms, and biomass facilities. Program organizers also hope to arrange visits with Santa Cruz city officials and legislators in Sacramento. Student projects will focus on the implementation of renewable energy resources relevant to California and to potential international collaborations. For more information about the program or how to apply, contact Ali Shakouri at (831) 459-3821 or ali@soe.ucsc.edu.